A mobile game with online co-op! There's been no shortage of games over the past few years that can be described as "like Minecraft, except...". Junk Jack X is one of those games, but it's far from a mindless copy of the creative sandbox titles that came before it. 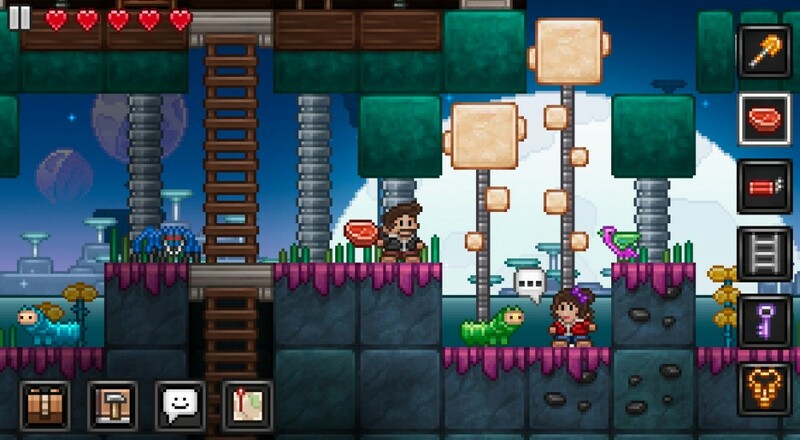 Pixbits studios recently released Junk Jack X to the iTunes App Store. The game combines 2D sidescrolling action, crafting, creating, mining, digging and everything in-between, all wrapped in a delicious pixel art package. Think of it as Terraria built specifically for portable touch screen devices. The biggest selling point for Junk Jack X is that it includes online two player co-op, something so few mobile games seem to bother with. You and a friend can join up for some cooperative adventuring as you tap blocks and harvest their resources, taking them back to your carefully crafted base to fashion them into more useful tools, weapons and building materials. If online isn't your thing, you can round up four local players for some multiplayer action, which we think is just peachy. Speaking of Terraria, a mobile port of the game was released on the same day as Junk Jack X. Comparisons and internet feuds immediately sprang up, as one of these titles clearly had to be the better game. Though no one can really call a definite winner, in our book Junk Jack X edges out Terraria thanks to its co-op support. Junk Jack X is currently available for iPhone, iPod Touch and iPad. Page created in 0.7963 seconds.